Today's post was going to be about low carb snacks then life got in the way. My son came down with over 103 degree fever. Unfortunately, this fever was also accompanied by a lump on his head that was developing a purple circle around it. Yikes! Last night, I drove him to the emergency room and began the LONG wait to see a doctor. You see that RING could be Lyme's disease, which if it is caught early will lead to absolutely nothing. But, if it isn't treated it can lead to nerve damage. SUPER YIKES! My son is five years old and the sweetest kid in the universe. He was crying on the drive over because he didn't want them to give him a shot. Also, he had slept most of the day, his eyes were bloodshot, and he hadn't eaten a thing. After being triaged into the packed waiting room (oh no! ), Alex noticed the large vending machines dominating the hospital hallway. Why they put Coke, Dr. Pepper, and Doritos in a hospital (a place that should be promoting healthy choices) is beyond me - but there they were. His eyes lit up for the first time in the day and he said, "Look, mommy! 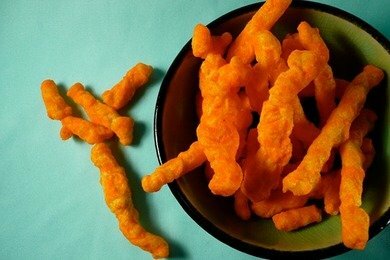 Cheetos!!!". I pulled out my dollar, pressed B5, and chose the Cheetos for him. Then, I got to sit in the waiting room while he munched on them, spilled them twice, and got covered in the bright orange dust that flows from Cheetos. I had a couple of thoughts, "Do these people think I am a bad parent for feeding him this stuff?" and "What is the doctor going to say about the streaks of bright orange all over his body?". Then, I remembered that I have put an enormous amount of thought and love into what I feed my son. It isn't that junk food is the enemy, it is that junk food is so prevalent in our society, workplaces, and culture that we have to work to not eat it ALL THE TIME. Snack Girl is about alternatives to what is all around us. Unless you live in a cave, you are offered Cheetos, Coke, candy, donuts, chips, and other processed food on a daily basis - multiple times a day. It isn't easy to say NO! to stuff that tastes good and is so affordable. A fun exercise is to write down the times you turned down a chance to indulge in junk food. For example, I went to a salon and managed to avoid the bowl of Easter candy - the same day I was offered a free sample cookie at the grocery store - and managed not to buy the 2 for $1 Reeses peanut butter cups at the local convenience store where I was buying milk that I forgot to buy at the grocery store. There is a CONSTANT stream of junk food in front of our faces and if you can avoid it MOST of the time, you are doing really well. Give yourself some credit today for what you managed to avoid (and don't beat yourself up when you eat the occasional free donut). How do you deal with our Junk Food Universe? What did you manage to avoid today? Alex was diagnosed with Lyme's disease and is taking antibiotics and looking MUCH better. Do You Idealize Hollywood Beauty? I am so sorry Alex has Lyme's disease and feeling thankful for western medicine in the antibiotic aspect. I'm so sorry about your son -- hope he feels better soon! For me, I ask myself if that junk for or sweets is worth the extra calories. Most of the time, I'll accept that the crunch bar isn't really worth it, but I will say that tortilla chips with my homemade turkey chili yesterday was totally worth the splurge. I'm glad to hear that Alex is poised to make a full recovery, Lisa. If I may be so bold as to sum up Doug Lisle's terrific "How To Lose Weight Without Losing Your Mind" talk (http://www.youtube.com/watch?v=xAdqLB6bTuQ) in one sentence, it would be: As often as possible, substitute healthy choices for unhealthy choices. I'm so sorry about your son!!! He'll be perfectly fine!! As for Cheetos, it's fine and if it put a smile on your sons face thats all that counts. We have to give in once in a while, no big deal! Life wouldn't be life without indulgences! Thank you for sharing the realities of life and food and the world we live in... Always trying to make smart choices for our family, but it isn't always easy. As you pointed out we are offered junk choices several times a day every day. Glad to hear you caught the Lyme's disease early. Thanks for the post today. Sometimes it's nice to put things into perspective. We need to do our best but not beat ourselves up if 100% of the time we are not eating perfect. Thank you! When I was a kid, my parents gave me fritos and root beer when I was sick. Now as an adult, I eat healthy (i.e. 5-7 servings of veggies/fruit, 2-3 servings of dairy, etc.). Recently, I've noticed that several of my coworkers bring in cookies, cupcakes, donuts, and other such treats, as "something nice" for the office. Wouldn't it be better if anytime we wanted to do something nice for our coworkers, we just brought in apples or celery? I am sorry to hear about your son and unfortunate experience, but glad you caught it early! I hate how hospitals and most offices have crap for vending choices. How will that ever help our ever increasing poor health in the world?! Keep doing what you do, I love the posts! Sorry about your son, poor little guy! It happened to my hubby last summer, and the meds worked great with no problems. Thanks for the reminder that it's okay to 'slip' into the reality that we live in with the food choices surrounding us. I'm with you in not understanding why some choices are in hospitals, clinics, and schools; the places that should be promoting health. I wish you all a speedy recovery. So sorry to hear about your son....and thankful he's getting better! You're an awesome Mom! I'm a WW leader....one day just 'because', I wrote down what I *wanted* to eat and at the end of the day figured up the Points (at that time). It came to a whopping 99!!! And, at that time, I was allowed 17 (on the old system). So it's all about choices. But a 'slip' once in a blue moon won't make you/me/us bad people. If ever there was a time to indulge, it's when there's a kiddo who's scared (and hasn't eaten all day!). Hoping he gets well soon! Unfortunately, vending machines offer choices that don't go bad (at least for a very long time) so many place opt for that other than fresh produce or something that goes bad quickly. Chips also don't need to be refridgerated so there's no added electricity cost. It's unfortunate, but there it is. I am able to withstand the temptation of vending machines mostly because I am a cheapskate and can't rationalize spending over $1 on 1 serving of anything when a full bag at the grocery store doesn't cost much more. That's not to say I buy chips at the grocery store either (at least not that often). I look at the prices there and say I don't need it that badly (besides, I'd rather have ice cream). and also - I was bitten by a tick for the first time EVER in March and was in a panic over getting Lyme's Disease. After doing some research on it, I was relieved to discover it wasn't as bad as I thought. I hope your son recovers quickly (and didn't get a stomach ache from the Cheetos). (so far I haven't shown symptoms and I'm keeping my fingers crossed they don't show up). I am so glad you caught it early. I hope he feels better soon. First of all, thank goodness your son is okay. How scary! I have an almost 5 year old too and I know how scary it is when they are sick. As far as junk food....I really don't worry about it too much. I try to give my family, and myself the best food possible most of the time, but hey, we all love junk food! I think as mother's we need to relax and not be so hard on ourselves for giving our kids/families a little here and there. Life is so short! I like to live by the 90/10 rule....good for you food 90% of the time and good ol' junk 10% of the time! I will only eat junk food if it's considered a 10. If it's not a 10, it's not worth the calories. I have quite a few 10's, so I negotiate with myself. If I'm going to have this carrot cake, then I won't have a carb with my meal, etc. Every now and then I want to give in to junk food that is not a 10 and I have to ask myself what is missing, like am i hungry or thirsty. Hi, I am sorry he has lyme disease as well. I had it in high school several years back and it is rough. There are alternative treatments to antibiotics though... Just wanted to let you know in case you are interested. You can find a good kinesiologist who will do testing and give you homeopathic tinctures which will cure the Lyme. I was better within 6 months compared to many who suffer for years.